Bold Victoria Bristol has worked her way up to a Level 7 Pirate. 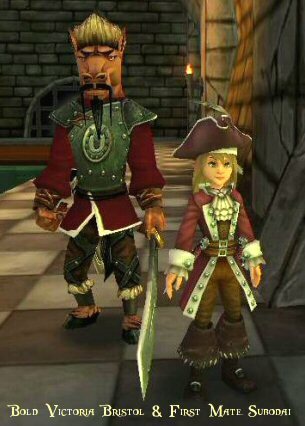 Along with her level 5 companion and first mate Subodai, they enter the Presidio. 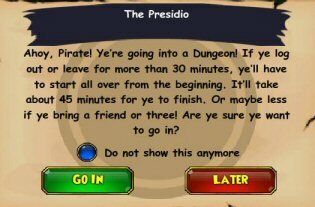 The first battle dungeon in Skull Island and the Pirate Spiral. Now if you’re not familiar with dungeons, these are areas that must be completed in one shot. You can’t leave and come back where you left off unless you’re sent out of the dungeon by a quest. Leaving and coming back before you have completed all the quests in the area will cause you to start each quest all over again. So make sure you have plenty of time to work through a dungeon from start to finish.